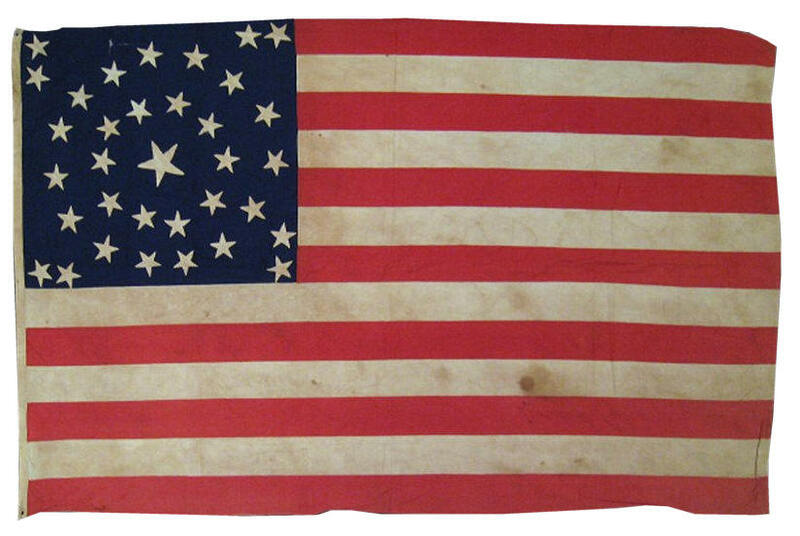 This flag of 34 stars dates to the opening of the Civil War. 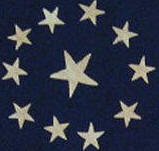 The flag would be extraordinary and rare even if it had adhered to the traditional design of a Medallion Pattern flag, featuring concentric wreaths of stars around a large center star, and, typically, one single star in each of the four corners. The maker of this flag, though, managed to elevate the flag to yet another level of beauty and rarity by the simple placement of an additional accompanying star in each corner, linearly arranged in alternating directions. This simple alteration results in a spectacularly kinetic pinwheel effect, giving the observer the feeling that the flag is in motion. It's precisely this kind of unique and unexpected dynamic that makes American flags fascinating to collect and enjoy. Flags such as this, even when born amidst the incredible strife of a period such as the Civil War, manage to project the spontaneity and exuberance of the American spirit across time and space to future generations of Americans. Any conjecture about the use of the flag is speculative, since the history of the flag's origins are lost. Given its cotton construction and narrow, delicate hoist, it most likely was not made for military use, though it's possible it was presented as a presentation color to a departing unit. More likely, the flag was made to be hung at a recruiting station for Union soldiers, or perhaps flown from a government building or at a local gathering place. Regardless of its intended use, it would have been eye-catching and beautiful to behold when waving in the wind.